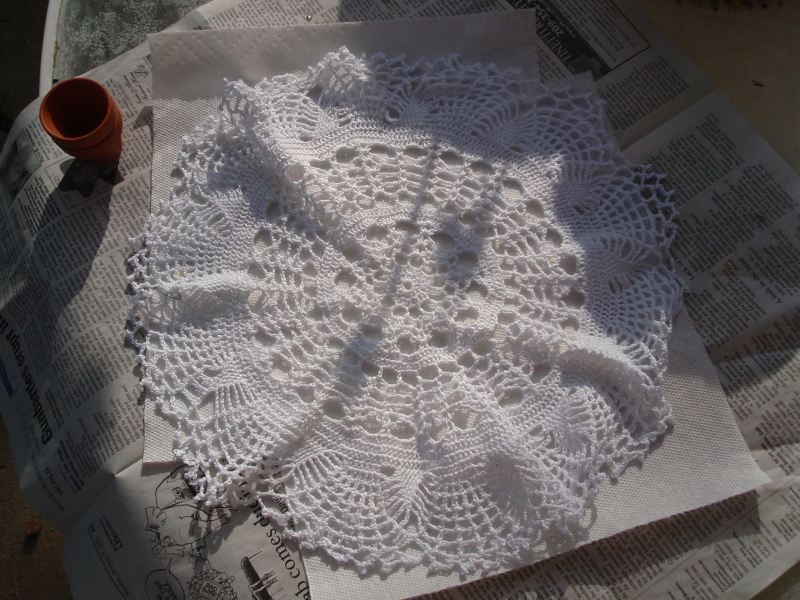 Here is one of my doilies, I took it outside for the first process, following the book’s directions, but found it was easier and cleaner to put the doily in a ziploc bag in order to saturate it with the fabric stiffener. 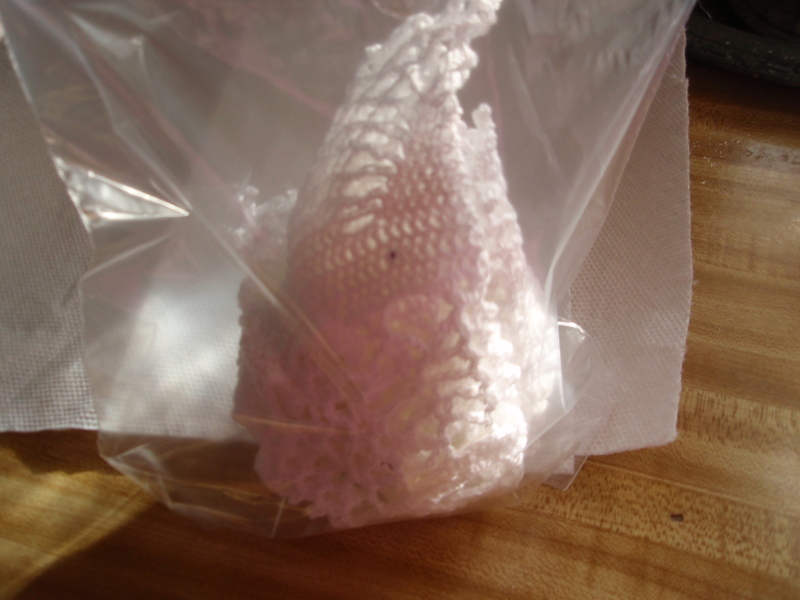 After placing the doily in the plastic bag, I poured the fabric stiffener it, working it into the doily and squeezing out the excess. 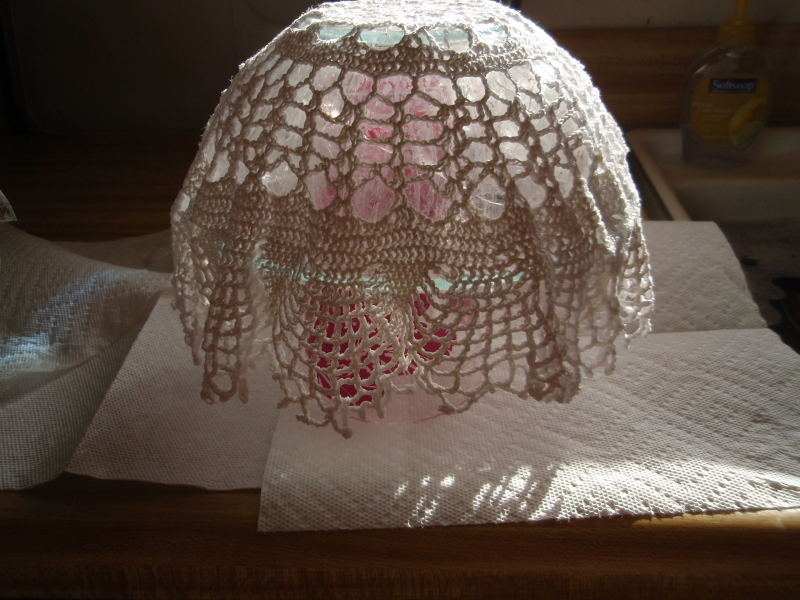 Then I covered a bowl with saran wrap (you could also use aluminum foil) and draped the doily over it. 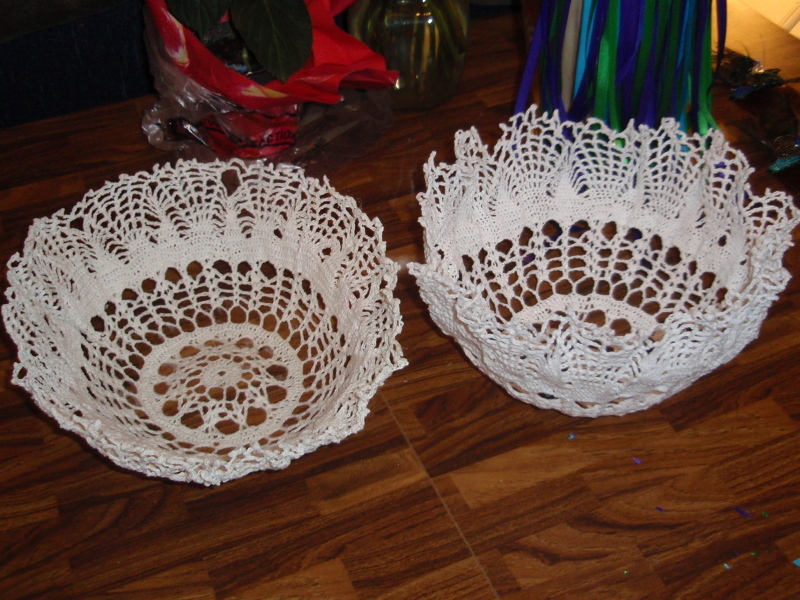 Since my doily was bigger than the bowl(s) I was using, I elevated the bowls with a couple of plastic cups. Just make sure that you put paper towels under the bowls so there’s no chance of the fabric stiffener dripping on your table (or countertop in my case). 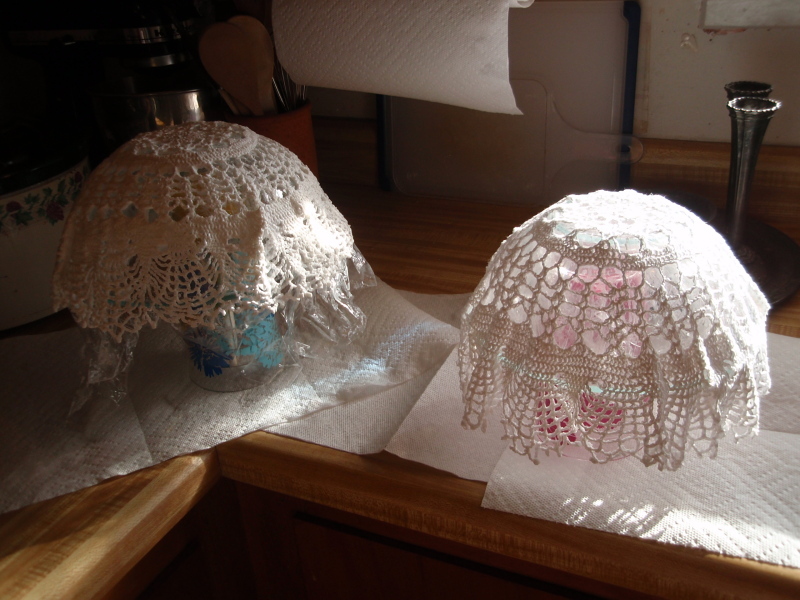 It took nearly a day for the doilies to dry, so make certain that you have adequate time for this project. You don’t want to start decorating the baskets until they’re dry. I made my baskets a little bit different shape from each other so that they aren’t exactly the same. 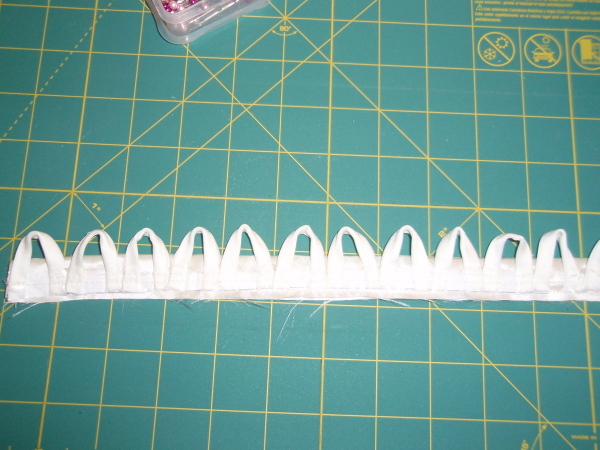 When the doilies were fully dried I cut about a 14″ piece of ribbon (I used 7/8″ grosgrain ribbon) for the handle. The length would depend on the size of your basket and how long you want the handle. I then tied the ribbon on each size of the basket, making sure that it was even and hung level. 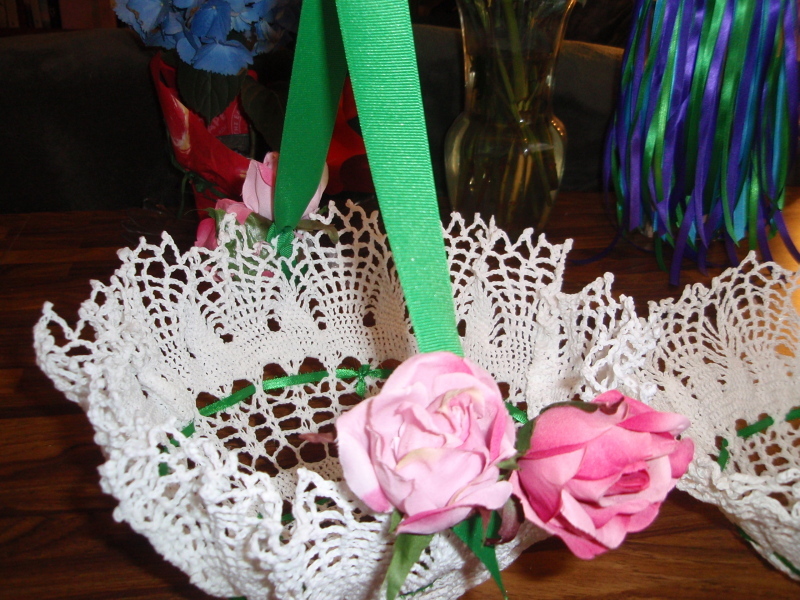 To finish my baskets, I wove 1/4″ satin ribbon into my baskets and used silk roses to adorn the edges of the handles where I tied them to the baskets. There is also some 1/4″ ribbon woven into the bottoms of the baskets which you really can’t see from the photos. Now my vintage flower girl baskets are all ready to be filled with rose petals!